The meat is soaked in vinegar for different purposes. First, to soften hard or old meat, and second, to eliminate the unpleasant aroma, particularly the game and, thirdly, to prevent the product from spoiling. Depending on what result you want to achieve, you need to soak the meat in different ways. Marinating meat with it smartstitch as vinegar is an acid, it destroys the muscle fibers. If you leave the meat in acid for the long term, you risk getting too powdery and friable product. By marinating, you allow the additional ingredients to penetrate deeper into the meat, so to give them more flavor and aroma. 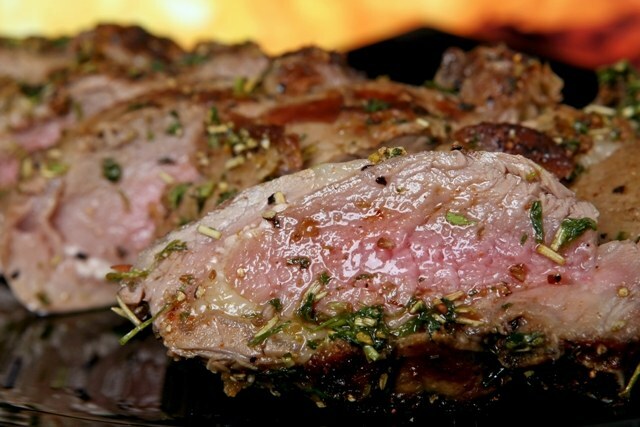 When marinating meat it is important to choose vinegar desired acidity, flavor and necessary to properly adjust the exposure time of the product in acidic medium. Choose vinegar depending on what flavor you want to achieve. Apple, cider and balsamic vinegar gives the meat sweetness. Wine can taste bitter, white rice and synthetic vinegar – the neutral, black rice vinegar has a light, but strong wood shade. The acidity of the vinegar should not exceed 9%, but divorced more than 3% vinegar loses all effectiveness. Mix the marinade and marinate the meat in a non-reactive closed container. That is, in any case do not use aluminium or cast iron containers, it is best to avoid metal containers. Ideal – plastic. Effectively to marinate the meat even in ordinary zip-package. The time required to marinate medium pieces of meat, no more than 4 hours. Don't marinate in the vinegar for fresh meat of domestic animals, for them is quite suitable citrus, wine, fruit marinades or flavored brine. Marinating dicedice soaked in brine with vinegar for at least 72 hours before cooking. For marinating choose the same container as normal meat. Every 8-10 hours, should change the brine for fresh. Old pickle will be painted leaving the game with blood, and with it the meat will come out a specific "odor". When the brine will become only slightly pink, you can stop soaking the meat and marinate it. Prepare a marinade of salt, vinegar and spices in accordance with your chosen recipe, marinate the poultry 12 to 24 hours and begin to cook. Storing meat in vinegarIn vinegar already stored cooked meat. You can pre-fry it or cook in water with acid. If you're cooking meat in vinegar, it is not necessary to drain the broth, and you should leave the meat to cool directly in the same water. When storing meat in the vinegar it is necessary to cut off from it all the fat to avoid later unpleasant rancid taste. Keep the meat in 5% vinegar in sealed glass jars in a cool dark place up to 1 month. For barbecue, you can use different types of meat: pork, chicken or beef. Plays a big role how the marinated meat. Most often in the recipes of a shish kebab from pork there is vinegar. Kebab made from pork with vinegar, will have a special aroma and a little acidity. 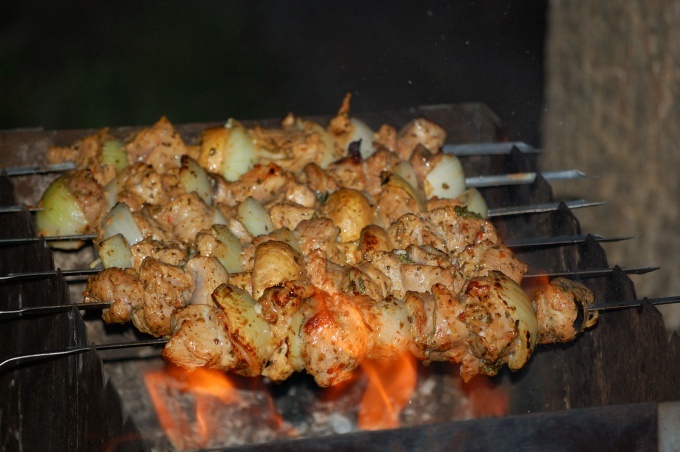 Marinade for shish kebab is cooked pretty quickly: it is composed of spices and acetic acid. When cooking kebabs, keep in mind that the taste will depend on which part of the pork you take: pork neck perfect for those who love bold barbecue; brisket for fans of lean pork; blade is universal: it is moderately oily and nasuha. In addition, the spade is fairly cheap meat, but the dish from which it turns out is very tasty. The vinegar will make the meat for the barbecue the tender, it will be great and easy to perezhevyvaya. It is best to use Apple cider vinegar (5 percent) you can also take a 9-percent vinegar. Try to add spices that you like, in a minimum amount: if you add a lot of spices to make such meat in the future will be impossible. - spices - to taste. Boneless pork, cut into pieces, onion wash, and then slice rings. The meat pieces mix well with onion, add salt and favorite spices to your taste. Acetic acid, dilute with water to volume of 1 to 2, add to meat, then mix well. Leave the meat in the marinade, it is necessary not less than 2 hours. - salt — to taste. Onions wash, clean and cut into large rings. Disassemble the shoulder with a sharp knife and remove the seeds, then the meat, cut into thin slices, put in a deep bowl. Pork must be well salt, pepper, and add Apple cider vinegar. After that, mix well and send the meat in the fridge for marinating. Meat must marinate for 3-8 hours. If you are going on a picnic, involving a long trip, then transfer the meat to skewers in the package, and then in the freezer. If possible, you can also use the cool bag that will keep your barbecue safe. If you don't have it, then near the package with the meat during transport can put a bag of ice or bottles of ice water. Marinated grilled pork in vinegar, you need to string on skewers and alternate with onion, then put on the grill, periodically turning and basting with water, cook on hot coals.